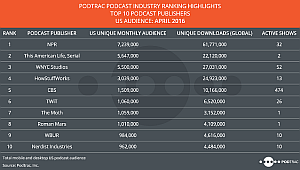 Podtrac, a podcast audience measurement company since 2005, today released its first monthly ranking of podcast shows and networks. Called the Podcast Industry Audience Rankings, the report is not just the first in a series for Podtrac, but the first ranker of its type for podcasting that we are aware of. Podtrac’s analytics technology is offered to producers as an opt-in service. As such, the ranking derived from that technology includes only Podtrac clients. In this way (and only in this way), the report resembles Triton Digital’s Top-20 Ranker of streaming audio properties derived from the company’s Webcast Metrics technology, which lists stream consumption of the company’s most successful clients. We don’t know which shows and networks are excluded from the ranker. We don’t know everything about what’s being measured, or unmeasured. Podtrac promotes its “proprietary and consistent measurement methodology” — consistency is obviously desirable, so the ranking has comparative value within itself. It measures “unique monthly audience” according to “unique downloads.” Podtrac explains that if a listeners hears several episodes of a show during the month, that person is counted once in Unique Audience, while each show download is counted — so the download count is higher than the audience count on every line of the ranker. Fascinating as this report is, there is an apples-to-oranges quality in the mingling of individual programs like The Moth Radio Hour with networks like CBS and NPR. Podtrac untangles them somewhat by listing the number of shows in each network. So it gets even more fascinating to compare Moth with the CBS portfolio of 474 shows. We predict calculator deployment as people look at this ranker. In coming days we expect much industry talk about what the Podcast Industry Audience Rankings means for the industry, and how valid it is. Audience measurement is widely regarded as a podcasting pain point — but not so much by network operators who run their own metrics (or rely on Podtrac, or both), and effectively sell advertising based on internal analytics. The quest for a third-party standard of measurement is sought by many podcasters, and is a field of competition for an array of technology companies like Triton Digital (partnered with Edison Research) and AdsWizz. Podtrac is clearly jabbing a stake in the ground. We’ll see how it sticks.